ASGARD Management Center controls the scanning and and also lets you take remediation actions if required. 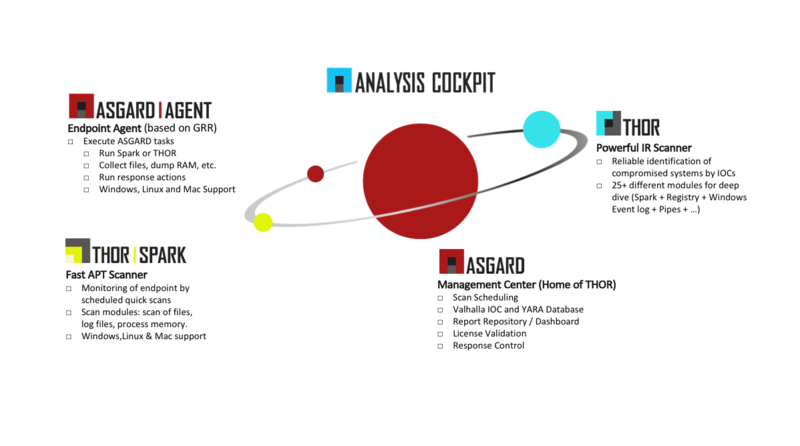 ASGARD AGENT resides locally on your servers and workstations. It can run both THOR and SPARK and executes your remediation commands. THOR finds those Hackers! Using over 20 different methods and more that 8.000 integrated rules. Of course you can also integrate custom IOCs and public feeds. SPARK scans with less methods (4) on Windows but it is much faster and also available for Linux and Mac. ASGARD Analysis Cockpit gives you the visibility after the scan results. Learn how to secure your enterprise in three simple steps. Want to know more about central scan control? How about running APT scans without an agent? Analyze your logs and integrate them into your SIEM infrastructure. Get to know more about equipping your CERT with the perfect tool. Go that extra step when all else seems lost and perform a DeepDive image scan.